Much like the rest of the world, I have become an addict of "The Game of Thrones" series. What started as a harmless binge watching session has evolved into a full blown addiction to the series and, unfortunately, the characters. No spoilers here, though! The series has proven to be an enchanting escape into a time where kings, knights and ungodly beasts roamed the earth. The 5th Wave was a last second grab for me. I love supernatural books but I usually draw the line at aliens. Nonetheless, I loved this book and am so glad I picked it up! 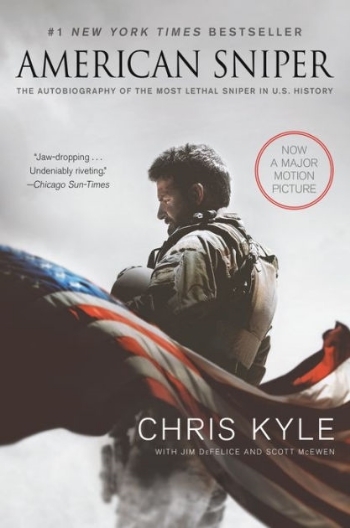 American Sniper was a reach for me. I typically stick to the mystical and supernatural genre but I always have a deep passion for true, heart-tugging stories. Chris Kyle's story was unbelievably moving and gave me a lot of insight into the lives and families of our military. It was interesting to see how many lives he touched, saved and empowered. It was an incredible read. The Divergent series was a fun read for me. I love self-empowered, destiny centered stories. I thoroughly enjoy getting lost in books such as these and letting myself experience the painful process of training and fighting like Tris did in this story. I even found myself comparing the parallels this series makes to real-life government and political issues. The Hunger Games was a series I decided to read with my dad. We took turns reading each book and going to see the movies when they came out. My dad and I have a similar liking for empowered, crime-fighting novels. This series was a stretch from his typical John Grisham novels but we both enjoyed bonding over this riveting, yet gruesome series. The Vampire Academy is my typical, go-to genre of books. I love the enticing love-story that is complicated by supernatural phenomenons and beings. I really liked The Vampire Academy series because there was always something new and crazy happening. Every page I turned lead to something more unbelievable yet incredibly easy to lose myself in. The Mortal Instruments was, by far, one of my favorite series to read. Though still supernaturally based, the story line focused more on the good vs. evil aspect in the world. I lost hours, days and sometimes weeks over these books. It was so easy to get lost in them that I never wanted to put them down. The City of Bones through the City of Heavenly Fire follows Clary, Jace and friends through numerous adventures in fighting demons, capturing immortal instruments and destroying Clary's evil father, while Clary and Jace try to figure out their complicated love story along the way. There was never a dull moment in this series and I would happily re-read every chapter of every novel. The Clockwork series focused on the distant past before Jace and Clary. This series explored the characters that made the Mortal Instruments series possible.